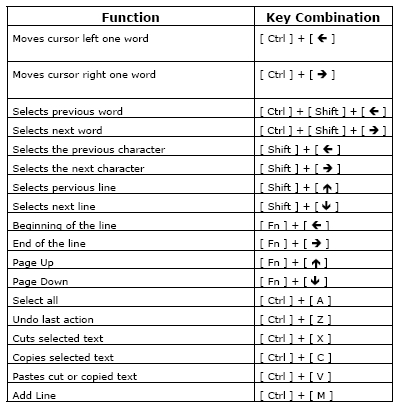 First of all, everything that I'm about to say can be found in the User Manual of this Keyboard that can be downloaded here. 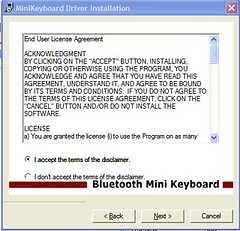 So I'm just going to add some comments and screen shots of my own experience installing this keyboard. 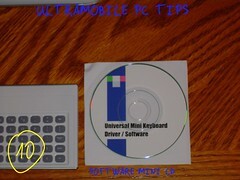 If you are planning to use this keyboard with your UMPC the good news is that you don't have to install anything. 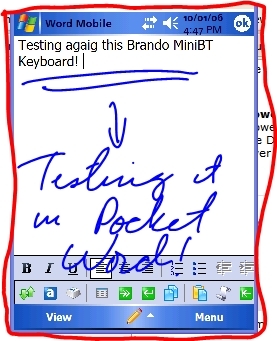 you open your BT software, look for a new BT device, pair it, it will ask you to retype a password, you do that in Brando Mini Keyboard and that's it. 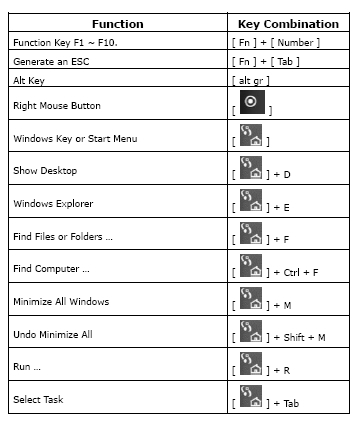 Here are some Standard Windows Short Cuts included in thisKeyboard. 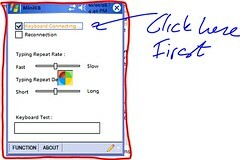 The situation is different when you are planning to use it in your Pocket PC. 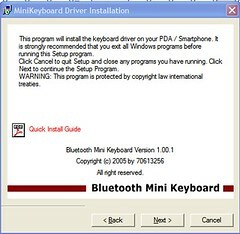 In this case you need to install the drivers in your Pocket PC so before your run the setup file from Brando's Mini CD, would be good if you connect your Pocket PC to your UMPC. In the above screen shot Brando gives you a list of Pocket PCs brands and models and I was happy to find the Axim x51v listed there. 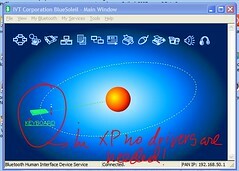 At this point the drivers and program are copied to your PPC. 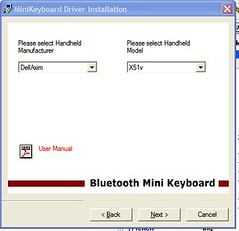 Once the installation is done in your PPC you will find a new icon listed in your Programs Window. ...You test it and you are ready lo use it. 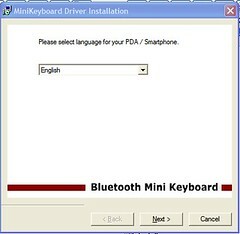 Just Minimize this program and open Pocket Word and start using this keyboard to write your documents and emails. 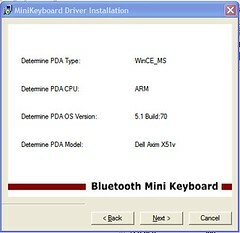 This keyboard is the perfect solution for people that own a Pocket PC and an UMPC. The small size of it make it the perfect companion for Packet PC like the Axim X51v which does not have it own keyboard. 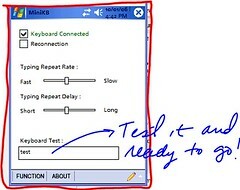 It will be faster to type using this keyboard than to use the screen keyboard. When you use this Keyboard with your UMPC you will get probably the same words per minutes than what you get using Dialkey and a little bit faster that if you use the TIP in Keyboard mode. I write faster using Handwriting recognizer than using Dialkey and TIP in keyboard mode so I find this keyboard useful when I'm programming where I use commands and variable names that are not common words. I would like to thank Brando for providing me with this keyboard to write this review. You can check the first part of this review here. It is very interesting to note that INTEL put on UMPCs all equipped with a keyboard. Indeed, I believe that it is necessary to be reasonable. Origami without keyboard is utopian. Thanks for the review. I have the keyboard and paired it once with my UX180P, but then couldn't match it up again after deleting the profile. My guide says, "Please press below 2 keys in sequence: FN+Home. When you press these 3 keys at the same time..." I tried the two keys, and it never reset. You pointed out the third key, which allowed for success. Thanks. Glad to hear that this review helped you! What the heck is the Pass Key ? Unfortunately I have the new HTC Star 100 (cingular 3125), and Brando's installation disk doe not have my phone listed, so I can;t install the software, but also if I just try to connect it without installing the software, I am asked for a Pass Key. There is no mention of a psas key in Brando's documentation, so I have no idea. 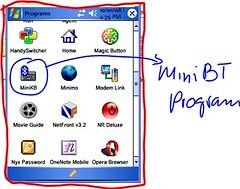 Select any pocket PC from the list and install the program. are you tired of using Google? $7000 dollars for an UMPC!